Is there a better alternative to Multiplying Acorns - Tasty Math Facts? Is Multiplying Acorns - Tasty Math Facts really the best app in Mathematics category? Will Multiplying Acorns - Tasty Math Facts work good on macOS 10.13.4? Multiplying Acorns - Tasty Math Facts takes your children to the market where they'll multiply, count, solve, and build confidence while earning coins for their efforts! 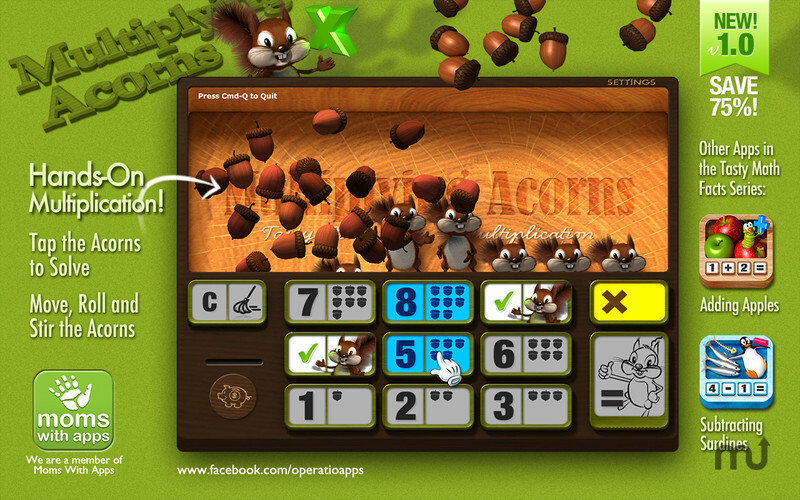 Multiplying Acorns - Tasty Math Facts is a fun, hands-on learning, math experience. The realistic, physics enabled 3D acorns create an immersive, manipulative-based environment for a thorough conceptual understanding of the times tables. Multiplying Acorns - Tasty Math Facts needs a review. Be the first to review this app and get the discussion started! Multiplying Acorns - Tasty Math Facts needs a rating. Be the first to rate this app and get the discussion started! The Tasty Math Facts series of apps use fun food items in a highly intuitive, interactive learning experience to develop a solid understanding of basic math facts!